In 1851 the face of lower Manhattan had drastically changed. The Great Fire of 1835 had destroyed as many as 700 buildings. But by now the business district had been mostly rebuilt as updated office buildings, mercantile establishments and other commercial structures rose over the ashes. That year the Hanover Bank began construction of its new bank building. The firm worked with Richard F. Carman on the project. Carman was already amassing a fortune by rebuilding the downtown area. A carpenter/builder and developer, he would later purchase approximately 23 acres in northern Manhattan to develop an entirely new community called Carmansville—a picturesque village of freestanding homes and barns. Whether Carman was the architect of the bank building is uncertain; however the result was an architectural gem. Completed three years later in 1854, the Italian Renaissance Revival building looked more like a brownstone mansion, perhaps, than a financial institution. Located at No. 1 Hanover Square (the square took its name from the bank), it rose three stories with pedimented windows and a bracketed cornice that bespoke understated elegant and dignity. Two shallow porticoes served as entrances. 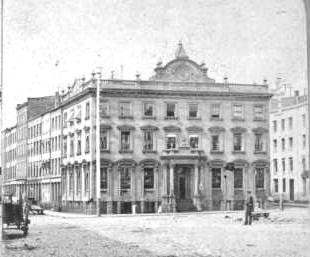 In August 1870 the New York Cotton Exchange was formed, starting out in small back rooms at 146 Pearl Street and trading around 15,000 bales of cotton per week. Only a year later the Exchange needed permanent headquarters and took over the building previously owned by Hanover Bank. The New York Cotton Exchange updated the building. Architect Ebenezer L. Roberts removed the matching stoops and created a single, centered entrance, framed by an elegant portico upheld by non-fluted Corinthian columns. A Victorian parapet was added to the roof with a clock and flagpole, and cast iron gas lights were installed on either side of the entrance stairs. The renovations—inside and out—cost the exchange a staggering $160,000. William Russell Grace took over the building as headquarters of his W. R. Grace & Co. Grace was born in Queenstown, Ireland in 1832 and, after running away from school at the age of 14, he worked his way to New York City on a sailing ship. The energetic Irishman spent some time in Peru before returning to New York to become a clerk, then partner, in Bryce & Co. (which became Bryce, Grace & Co. and then Grace Bros. Co.) and Mayor of New York between 1881 and 1882. 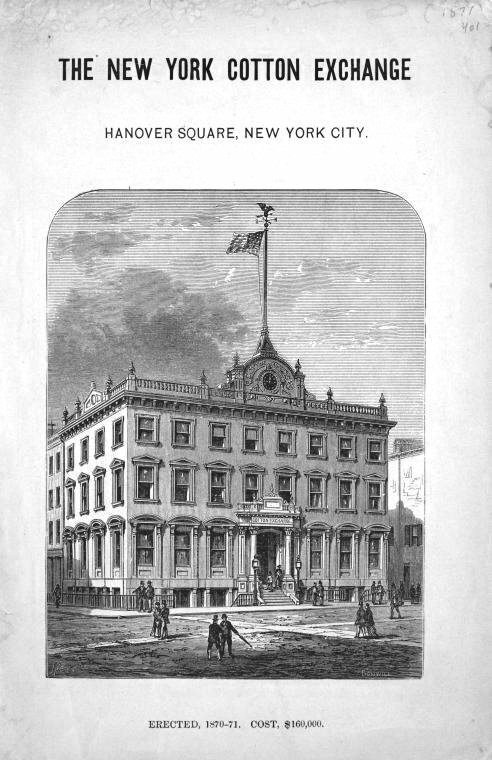 By now he had established both the W. R. Grace & Co. firm and the New York and Pacific Steamship Co., was president and director of the Ingersoll-Sergeant Drill Co., director of the Central and South America Telegraph Co., the City Trust Co., Eastern Insurance Co., The Evergreens, Lincoln National Bank, Terminal Improvement Co. and the New York Mall and Newspaper Transportation Co.
William Grace died in 1904 and around the time that W. R. Grace & Co. moved out of the building, Joseph P. Grace, along with several other moguls including Willard Straight, became interested in forming a society of businessmen who were involved in foreign trade. 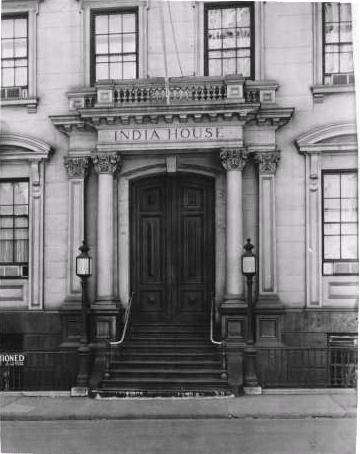 The result would be India House—a men’s club whose name gave a nod to the Dutch West India Company that colonized Manhattan. Renovations were begun to convert the former business building into a clubhouse “so that in foreign cities members will have a place in which to feel ‘at home’ and to entertain,” said The Times. Architects Delano & Aldrich were given the commission. To add ambiance, “a collection of prints and paintings of old merchant vessels and scenes in the distant ports to which they sailed will be placed in the club,” said the newspaper. It was the seed of what would become one of the most important maritime art collections in the country. The architects took an Edwardian look at the Victorian changes Roberts had made in 1871 and, apparently, clucked their tongues. They stripped the façade and roof line back to its purer Italian Renaissance roots and, with brownstone construction long out of favor, painted over the chocolate-colored stone. Two years later the same newspaper would remark on what was now an impressive art collection. “These enthusiasts set about the making of India House in the right way. The first thing they did was to create an atmosphere. This they accomplished by gathering what is without doubt the most extensive and valuable collection of pictures relating to the sea glory of the United States in existence. Willard Straight purchased the property in 1918 to ensure that the club would not lose control of it, giving India House a ten-year lease with the option to buy. On December 1st that same year he died. 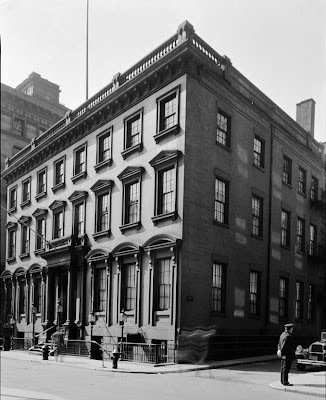 On February 16, 1921 The Times reported that India House would purchase the building from Straight’s estate for $650,000. The club, as well as its collection, continued to grow and in 1925 architect William A. Delano, who was also a member of India House, was brought back to enlarge the clubhouse, adding the Marine Room. A maritime motif of sea creatures and shells reflected the seafaring theme of India House. Other alterations were made at the time with a focus on early American overseas trade in the decorations and architectural detailing. In 2002 the club initiated an investigation into the scope of necessary restoration—including the removal of a stucco-like covering on the brownstone façade. Extensive restoration was completed in 2005. India House remains the private club of businessmen involved in foreign trade. Members have included Franklin D. Roosevelt, W. Averell Harriman, George C. Marshall, Cyrus Vance, Henry Cabot Lodge, Henry Morgenthau, Jr., and several mayors of New York. The art collection is considered among the finest privately-held maritime collections in the nation. The magnificent brownstone building sits like an imperial presence beneath towering skyscrapers, unimpressed by her lofty modern neighbors. 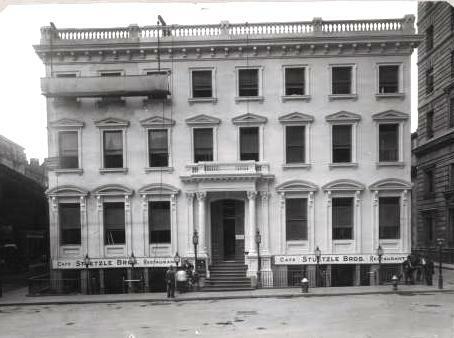 Nice historic pictures of a building that I was vaguely aware of but thanks to you, now know much more! Would be nice to see some current internal pix and/or a floorplan! This building was also used in the movie "Kate & Leopold" with Meg Ryan and Hugh Jackman. I stumbled across the building today and it is so beautiful!